Shinner's sunflower is a burst of yellow along the highway. If you are a plant enthusiast in Texas, you’re familiar with Thomas Drummond, Ferdinand Lindheimer and Charles Wright. These early botanists are remembered through the many plants named after them, including Clematis drummondii (old man’s beard), Datura wrightii (western jimsonweed) and Lindheimera texana (Texas yellowstar). The notable trio of botanists collected Shinner’s sunflower specimens in their travels throughout Texas. Their collections of this plant and others, about 150 years later, now reside in herbaria throughout the United States. As a botanist, I re-locate rare plant populations. Herbarium specimens (and their helpful labels) offer the first clues in my search: the species and the collector’s name, plus the collection date and location. But only the actual plant, carefully dried and pressed, can reveal what it looks like — down to its last minuscule hair. The real thing is, truly, worth a thousand words. Shinner’s sunflower specimens show a basal rosette of leaves, notably narrow and lance-shaped phyllaries (the green leafy structures behind the flower head) and opposite leaves on the stem. Interestingly, multiple specimens of the same plant can differ. During recent surveys, we saw a very Shinner’s-looking plant, but with alternate leaves, not opposite. It’s a fairly common variation in the genus Helianthus: While leaves are mostly opposite, they can become alternate closer to the flower heads. Shinner’s sunflower is one of my favorite rare species because it’s drive-by friendly. 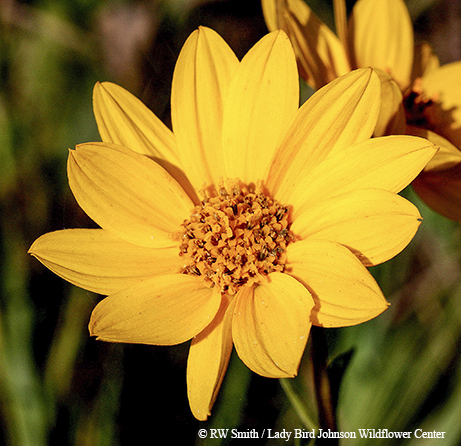 It stands a conspicuous 2 to 5 feet tall on highway rights-of-way, one of only a few yellow sunflowers with yellow centers in bloom in late summer and fall. Its general profile is easy to detect at highway speeds, especially if you employ passengers to keep watch while you drive. While Drummond, Lindheimer and Wright might not have approved of this “high-speed botanizing,” it makes me smile to think I’m following in their footsteps — or at least wheel treads — collecting specimens along the way. Occidentalis means "western" in Latin. The plant was first described in 1836, when the Great Lakes region was considered the western part of the United States.